Experience the wonder of the very first Christmas with this magical changing-picture book. 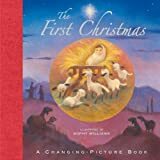 The classic Christmas nativity story is stunningly illustrated by evocative pastel artwork depicting angels, shepherds, and wise men arriving in Bethlehem to share the magic of the birth of Jesus. Lift the gatefold flaps to change the pictures and watch the story unfold along the way. Thomas delivers trainloads of fun! The town of Tidmouth is getting ready for the big Christmas party—and poor Thomas is lost in the snow! Children will be thrilled as they lift the festive flaps to rescue Thomas and decorate the town for the holidays. This sturdy, interactive book also includes six colorful press-out ornaments featuring Thomas and his friends.